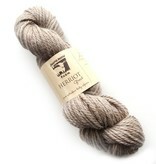 Juniper Moon Farm Herriot Great is two plies of squishable, touchable alpaca goodness! This chunky yarn is warmer (and lighter in weight) than wool, making it perfect for when you want a sweater that doesn't weigh a ton, but will keep you toasty on even the coldest day. It's super soft - our customers keep finding excuses to "pet" our samples in the shop - ensuring that whatever you make with it will be cuddly and wonderful to feel against your skin.